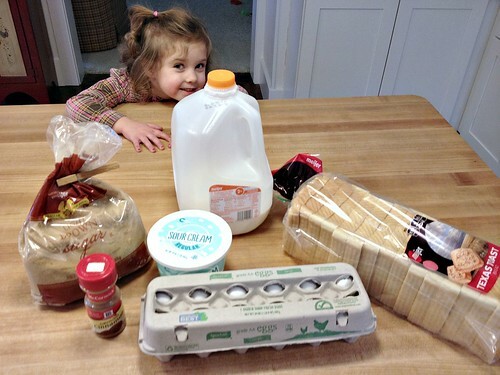 As I’ve mentioned many times before, our family LOVES breakfast for almost any meal of the day, especially for dinner. And it just so happens that breakfast is an extremely simple, frugal meal that usually doesn’t require a ton of prep-work or a ton of time — so yes, we eat it a lot! 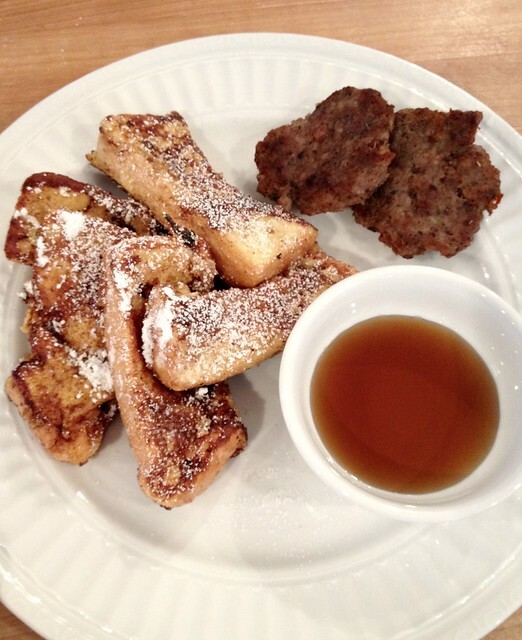 French toast is one of our favorite breakfast meals (served with eggs, sausage or bacon, and fruit). I’ll also use our breakfast-for-dinner nights as another “excuse” to make our favorite smoothies. Side Note: I’ve been sneaking carrots, spinach, flax seed, and squash into our smoothies without Nora noticing a thing! 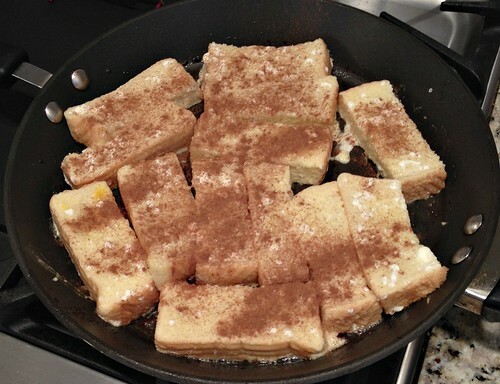 Anyway, I shared a picture of these French Toast Sticks on Facebook a couple weeks ago and immediately started getting questions about what they were, how I made them, if there was a recipe, etc. etc. 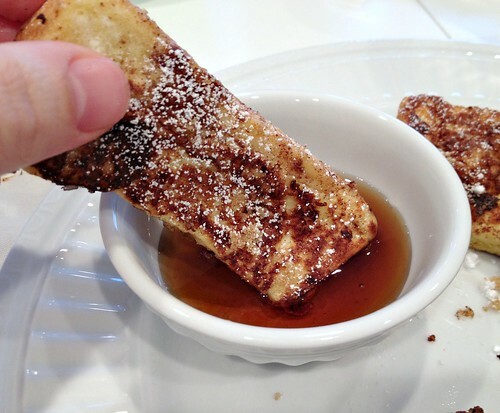 I honestly didn’t think French Toast Sticks would have been such a conversation topic, but since they are SO quick, simple, and easy, I figured it would be a good recipe to share here on the blog! Please note that these ingredients are NOT exact in any way — I just sprinkle a little of this, add a little of that. You truly can NOT mess up this meal unless you burn the french toast completely black. 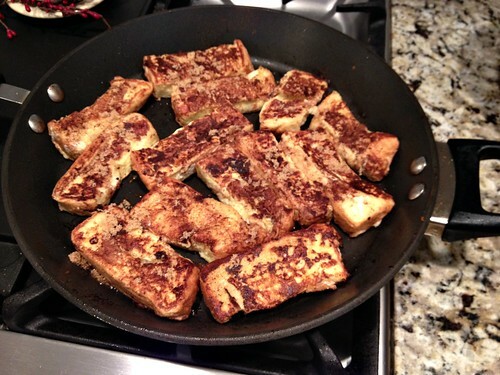 Also, if you have bread that is slightly stale, it works REALLY well for French toast sticks! 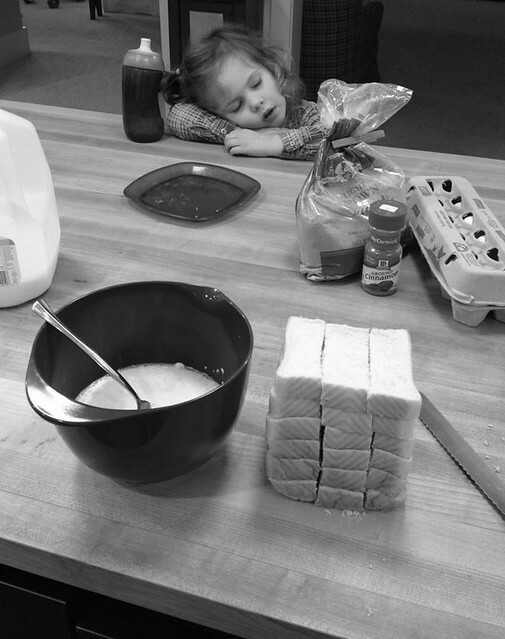 milk — I used about 1/2 c.
powdered sugar — I LOVE French toast with a light dusting of powdered sugar. It makes me feel like I’m at a fancy restaurant! Of course, you’ll probably also want some syrup for dipping — maybe some butter too if you’re like Dave. 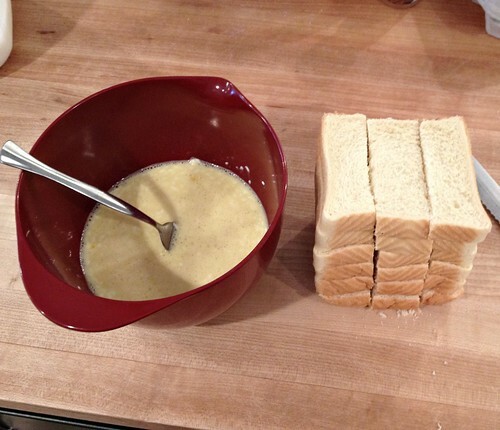 Cut slices of bread into 3 or 4 sticks depending on how big your want your French toast sticks to be. Mix eggs, milk, and optional sour cream in a medium size bowl until combined. 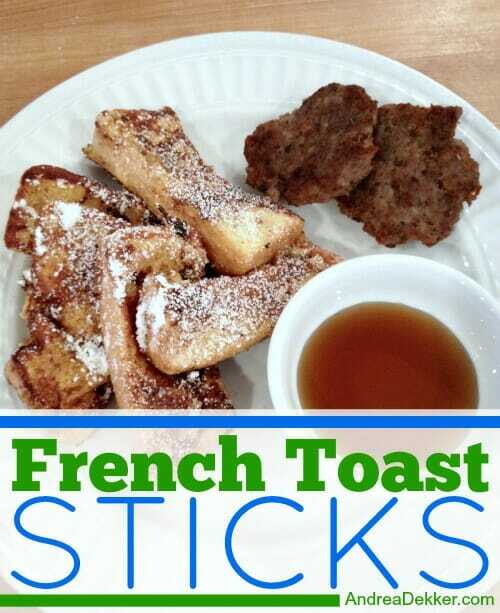 We LOVE these French toast sticks for any meal of the day — served with sausage, maybe a fried egg, and fresh fruit. I’m certain this recipe could be made with gluten-free bread, non-dairy milk, and even with egg substitute… so there’s almost no excuse not to give it a try. I guarantee your kids will gobble it up! Find all my favorite breakfast recipes here! 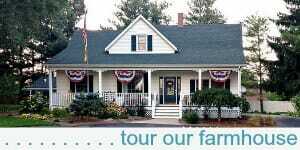 Sometimes people find my little blog ‘My Yellow Farmhouse’ by using the search words ‘Farmhouse Love’ – so I entered those search words and came across your lovely blog about your old farmhouse. I was disappointed to see you no longer post there BUT I’m very pleased to have found this ‘incarnation’ !! 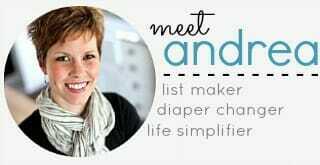 What a wonderful blog – I don’t know how you do all that you do!! And it was great fun to see you now have two little ones – it’s a good thing you’re so organized !! 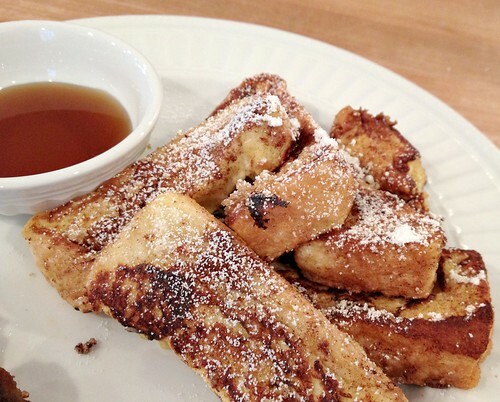 These french toast sticks are on my menu for Sunday morning. Do you have a place on-line where you store all of your recipes like you do for your photos? I want a virtual recipe box and not sure which direction to go. I would be so unhappy if I went to the trouble of loading all our recipes and then have the website go away. Thank you for any in-sight or personal experience you might share! Plan to Eat sounds amazing. I am going to look into it further. 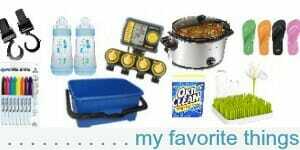 I also just heard about Food.com, I’m going to check that out as well. Thank you and I so enjoy your blog….you and Dave are so wise and such great parents. Made these for breakfast this morning. It was my first time ever making French toast, and my hubby was so excited. :). They turned out great! These would be a great make-ahead breakfast- do you have any experience in freezing them- how they turn out? I have made them, and stored the leftovers in the refrigerator for the following morning, but I’ve never frozen them before. I did think about that before writing the post — as I’ve seen frozen french toast sticks at the store, however I didn’t personally try it myself. I know the french toast sticks from the store are usually deep fried before they are frozen, so that might make a difference — but it certainly wouldn’t hurt to try a small batch and see how they turn out! Thanks Barrie! Glad they turned out and that your kids liked them too (win win)!! Thanks for sharing! These look delicious and the ingredients are something I usually have on hand! Thanks for sharing!! LOL Nora sleeping. That is just too cute. I know, it was so crazy (especially for HER) to just fall asleep. She must have been REALLY tired! Well, read your post at 9:00 a.m. and decided I would just make it right then and there cause I had half a loaf of your beer bread recipe left over. Going to snack on this all day. Haven’t made French toast in ages. This is a very good recipe. Thanks for the post. haha — well glad I gave you inspiration for your breakfast AND your snack. Hope you liked them! !